Richard Newman and Gina Chiarelli in Mark Leiren-Young's new comedy, Bar Mitzvah Boy. Photo by Damon Calderwood. 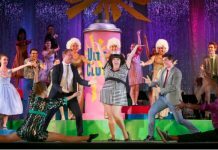 Mark Leiren-Young’s new comedy Bar Mitzvah Boy may deal in the Jewish faith, but it could just as easily be Catholicism, or pretty much any other religion. Divorce lawyer Joey’s grandson is about to turn 13, and according to Jewish faith, he is ready for his bar mitzvah. Problem is, Joey, who also happens to be a lapsed religious Jew, lied about receiving his own coming of age ritual when he became a teen. Now, desperate to secretly have his own bar mitzvah before his grandson, he turns to Rabbi Michael to help fast-track him through the necessary lessons. While dealing in a much bigger crisis of faith in her own life, Rabbi Michael eventually gives into Joey, agreeing to prepare him for his bar mitzvah. Over the next 90 minutes, the two will bond, the teacher will become the student, and a second crisis of faith is adverted. In the first part of Leiren-Young’s script, the comedy is aplenty. And while much of Leiren-Young’s jokes are indeed funny, they come so fast and furious it initially feels more like a stand-up routine than stage play. In fact, it isn’t hard to imagine the two on stage at the Yuk Yuk’s Comedy Club, coincidentally just a straight shot down West 12th from Pacific Theatre, where Bar Mitzvah Boy is currently running. Fortunately, as we get deeper into the story, Leiren-Young finds a more realistic balance between the comedy and drama. What remains is a heartfelt, but ultimately unsurprising, exploration of belief, religion, and what it means to be part of a community. 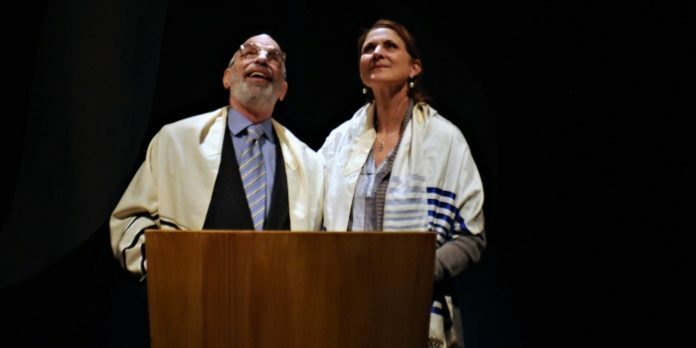 In what is ostensibly a two-hander (the voice of Rabbi Michael’s secretary is played by an unseen Jalen Saip), Bar Mitzvah Boy is handled beautifully by Gina Chiarelli and Richard Newman. There is a clear chemistry between the two, allowing for a realistic bond to form between them. While Chiarelli felt rushed at the start, she quickly settled into her role as Rabbi Michael. Despite the predictability of her journey, she does find depth. Ultimately believable as a spiritual leader, despite the personal struggles she must overcome, there is something comfortable and welcoming about her portrayal. Under the direction of Ian Farthing, there is a wonderful transformation in Newman’s portrayal of Joey. And while that transformation felt a little hurried, there is an underlying vulnerability against his initial façade. Dealing largely in some fundamental questions of faith (why does god allow bad things to happen), literal versus metaphorical teachings of the bible, and the impact of ritual on establishing community, Bar Mitzvah Boy breaks little new ground. But at the crux of most organizations, secular or not, remains an inherent desire in its members for belonging and community. Bar Mitzvah Boy is a reminder of that basic human need. And while the answers, especially in faith-based religions, are rarely tangible, and certainly never black-and-white, they can still be profound in both effect and contemplation. Bar Mitzvah Boy by Mark Leiren-Young. Directed by Ian Farthing. A Pacific Theatre production. On stage at Pacific Theatre (1440 West 12th Ave, Vancouver) until April 14. Visit http://pacifictheatre.org for tickets and information.